I purchased a series 1 Apple Watch and needed a case that was protective. Due to the series 1 not being water proof, I purchased the Catalyst. I was in Monterey, Ca for work, and was visiting Monterey Point for lunch. I saw an older couple sitting on rocks at the end of a small jetty filming the seals. The weather was horrible, very cold, windy, and began to rain. Due to the rain the couple were going to return to their car. The older gentleman Richard was trying to get his wife Karen from her seated position. I noticed he was having trouble and made my way out to them to help. I was able to get her on her feet as the weather became worse. As we were walking along the jagged rocks Richard lost his footing and slammed into me, which propelled me forward. I could not gain footing and ultimately went into the water after hitting rocks with my knee and hand. It was chest deep water. Karen was appalled as my knee was bleeding profusely, along with an injury to my hand. I returned Karen to her car and went back for Richard. They could not apologize enough. Soaking wet, I went to my appointment 5 miles away. That is when I noticed my Apple Watch along with the Catalyst case gone. I went back after my meeting to look for my watch without success. Two and a half weeks later, I took my family to the spot to show them where Dad fell into the ocean and attempt to have a good laugh. Obviously we did not find anything. The next day, a Sunday, I get a phone call from a person who claimed to have found my watch hours earlier. She stated she charged and found contact information. I met with this person this past Monday to find that indeed, she had my watch with the Catalyst case. She stated she found it after a wave brought it up to the sand exactly where I lost it. The band’s clasp was broken off from when my hand hit the rock. The Catalyst case made it possible for my NON WATER PROOF series 1 Apple Watch to survive in the ocean during very bad weather for TWO AND A HALF WEEKS......... There are minimal scratches to the bezel for being thrashed around in the surf and sand. Thank you for making a product that protects and otherwise goes above and beyond what it’s original description states. Please add to that description, “May last weeks in the heavy surf and sand of Monterey”. 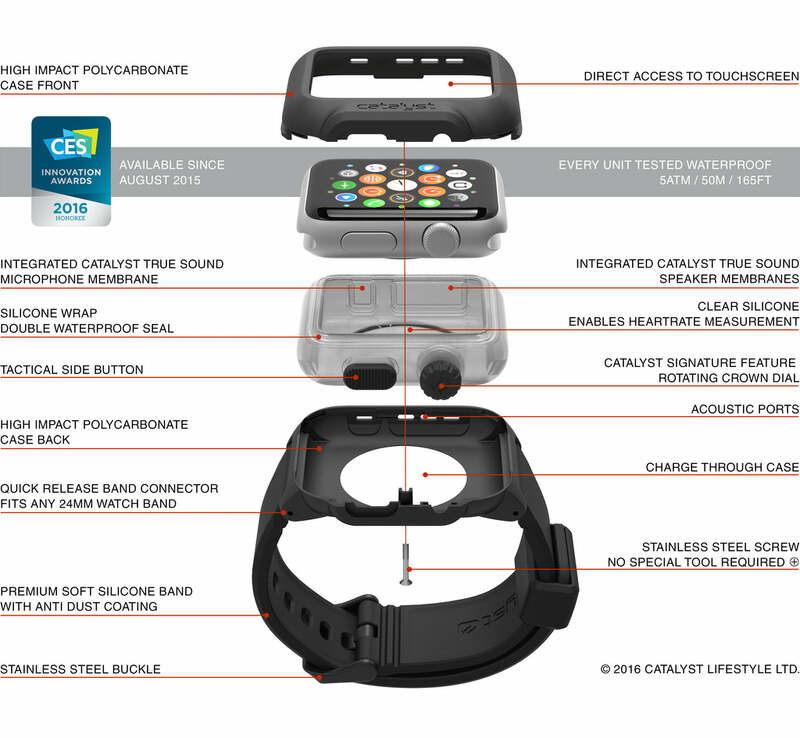 I’ve tried other “waterproof” cases or protective cases for my Apple Watch. Most work well, but when it comes to charging on a stand they won’t stay on. This is the first one I’ve bought that works with my charging stand, and can do both waterproof and be protective. Only thing is I wish they had more than the two color options available. I would definitely by again.. I actually want the all black watch case & phone case. Excellent... that's my third band !